I am in the process of making a harness for my Mikasa Ackerman Attack on Titan (SNK) cosplay. Part one of the tutorial will show you how to measure and make the straps you will need. Part two will be assembly (currently working on that). First, sketch it out. Below is a good reference image, and my sketch. My sketch is exactly the reference image, however going through sketching it made it make a little more sense, so I recommend it. 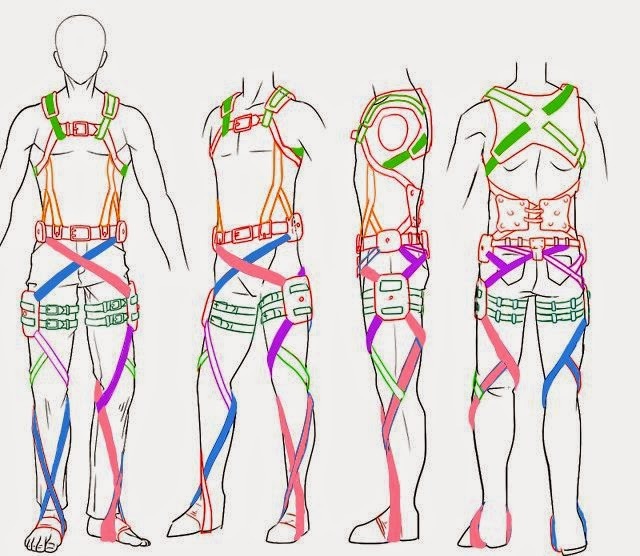 Once you've done your sketch, you should have an idea of how many straps you want. Now comes measurement. Using your sketch as a guide, measure where each strap will go and mark your measurements next to the coordinating strap. Sorry for the crappy image here. But hopefully you get the gist. Now, some of the straps are thinner. My blue strap (per sketch), yellow strap, and the two thigh straps I decided to make 1", and everything else 2". Choose your fabric wisely. I chose a dark brown suede fabric that I got dirt cheap at a Hancock sale. The width will need to be multiplied by 4. For example, for your 1" straps, the width should be 4". Your 2" strap, the width should be 8". Measure everything, and use a ruler! I highly recommend getting a yard stick for this. Add 4" to each of your length measurements, just in case you messed up the measurement. Measure and cut your fabric. Next, you are going to make these strips into bias tape. If you don't know what that is, google it, or buy some and look at it, so you have an idea of what this next step entails. First, fold a strip in half lengthwise, and press. I recommend pinning since these strips are so long. After pressing the entire length, unfold. Then, fold in one side to the fold line and pin. Press. Fold together at original fold. Do this to all of the strips. It's super time consuming, but very necessary. After you've done this, it's time to sew them into strips! This next bit is very complicated, and I don't trust my way with words, so at the end of the blog is a video to help if the explanation here confuses you. First, unfold original fold so that you can see the two sides folded in. Flip over. What you see is the right side of the fabric. This is the part you want to show. At the ends, pin with right sides together. Sew, using a 1/4" seam allowance (or more if you need). Next, use pinking shears (I think that's what they're called) to trim the edge with a zigzag pattern to keep it from unraveling. Turn right side out and push out the corner (I used a mechanical pencil to do this bit). Repeat on other end. Now, it's time to sew the strip closed along its length. I recommend doing this next part on the open side first, then the folded side. On my 1" pieces, I used 1/8" for the hem. On my 2" pieces, I used a 1/4" hem. Starting at one end, sew the entire length of your strip. Repeat on other side. And that's all there is to making your straps! This is the easy bit. Part two, assembly, is much more difficult. 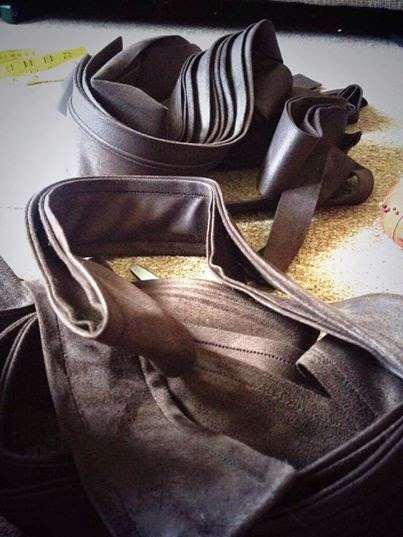 You should now have a pile of finished straps. And, as promised, a link to a 5 minute video showing you how to sew the straps, since wording it was a bit difficult.